CTS appears to have hit Hatch’d in Kensington in the aftermath of a rush hour. The salad bar at the place (497 Macaulay Road, Kensington; phone 1300 428243) is exhausted and the two wooden tables provided for eat-in dining need clearing. But hey, I figure this is a fine thing. Surely, it must mean that this joint’s food is popular, and thus good, even on a Monday night. I soon find out that is indeed the case. The chips are fresh, though I could live without the chicken salt seasoning. The coleslaw – the salad bar has been topped up subsequent to my order – is fresh, though some sharper flavours would be handy. But at Hatch’d, the bird really is the word. As ever, as in ordering a medium bowl of pho when I know a small offering will more than suffice, I succumb to ordering a half chicken when a quarter would be adequate. No matter – when I am done there nothing but a pile of bones on my plate. 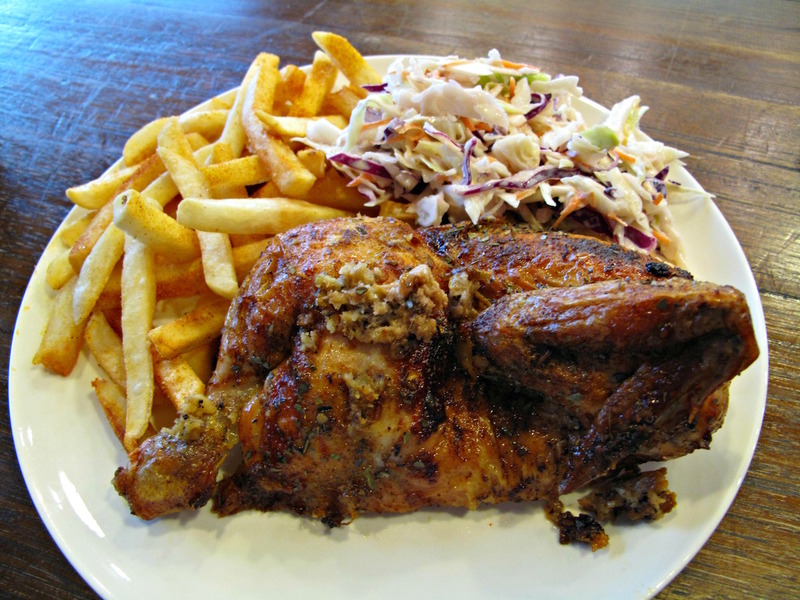 This is an excellent charcoal chook – juicy, flavoursome, wonderful. Even the breast meat requires neither stuffing (of which there is little) or gravy (provided at my request in small bowl at no charge) to be enjoyable. An interesting perspective … a similar meal, of similar quality – but with slightly different seasonings and presentation – would cost at a fancy hipster barbecue establishment at least $10 more, and maybe even double, the $16.50 I have paid here. While I have been enjoying my meal, a stream of customers – and almost as many Uber food drivers – have come and gone.